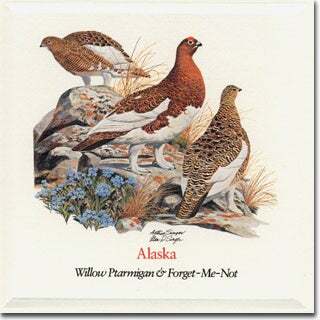 Found in all parts of Alaska, the Willow Ptarmigan remains in the northland all year, and does not migrate south as so many other birds do. Fully adapted to the north country, it turns snow white as camouflage in winter, and has fluffy feathers on its legs that both help keep it warm and also serve as snowshoes. In the spring, this ground-nesting bird acquires a brown plumage which allows it to blend with the Alaskan tundra. Growing all over Alaska, this deep blue flower with a yellow-eyed center has hairy leaves and curled flower heads which were thought to resemble a scorpion's tail and provide an antidote for its sting. The Forget-Me-Not was designated the official state flower of Alaska because it is thought to be a flower of constancy and perseverance; traits which perfectly characterized Alaska's first intrepid pioneers. 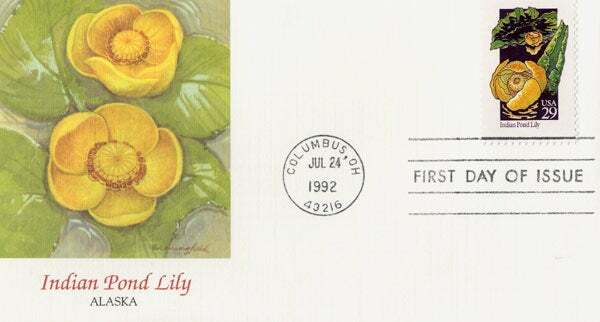 Alaska Wildflower - Indian Pond Lily Art from the 50-stamp series, State Birds and Flowers, issued April 14, 1982 simultaneously in all state capitals..